I am an avid supporter of any government in power, I respect and will continue to do leaders of my beloved country Zambia. Recently, my mood about the politics in our country have left me speechless. Why are we allowing our leaders whom we have put as custodians of our well being to enrich themselves through corrupt means while the majority of us, the taxpayers and voters who elected them in office are living below the poverty datum line? When are we going to wake up and araise and refuse these practices. Are we so weak and fearful of the government that we elected to the point of paying a blind eye to what is happening in our country; are we going to continue allowing our leaders to continue abusing their offices to enrich themselves and their families? Cry my beloved Zambia!! As long as we are looking and just let them do what they want, we will be partly to blame for our suffering! The Government of the day has failed us, the cheap politics in play at Plot One are beyond comprehension. OUR once vibrant Ministries especially line Ministries have been brought to their knees because of poor decisions! Diplomatic missions are now institutions meant for members of the Head of State, Ministers and Permanent Secretaries relatives, girlfriends and party cadres, whether they have gone to school or not. Most qualified persons who are improving the image of our country are being dismissed for myopic divide and rule reasons! Zambia is not for one person, we the general public are the Zambians and you people in government offices have been given the mandate by us!! Enough is enough, the people of Zambia are tired. Continue your foolishness but not on the expense of people who voted you in power!! 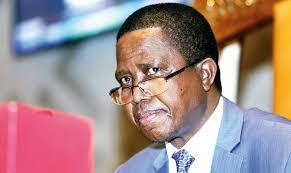 Zambians lets arise and kick The PF Government out of power, we cant allow this to go on! I was the greatest supporter of President Lungu but I cant defend him anymore! He is not fit to be President!